A leading industry expert has warned that the global trend towards increased regulation is affecting even strong emerging economies, such as those in Latin America. Director of Credit Suisse Ltd Francesco Vanacore told members of the financial community that countries all over the world are facing an increasing regulatory burden and Latin America is no different. Countries such as Brazil and Peru are operating under a “huge regulatory framework,” he said. Speaking at the Nassau Conference, held at the British Colonial Hilton in Nassau earlier this week, Vanacore pointed to recently introduced legislation in Brazil that, if passed, will require providers to file an anti-money laundering report if they find evidence of tax evasion. He added that Peru was looking at new anti-avoidance measures also. He said that this is a trend in the area and countries such as Argentina and Uruguay are also highly regulated, but explained that this gives a degree of certainty to transactions. Vanacore said there are opportunities in the region in the insurance sector. He also noted that the focus is shifting from simple savings to “non bankable” assets. Vanacore said that 95 per cent of Credit Suisse clients are families with connections all over the world. 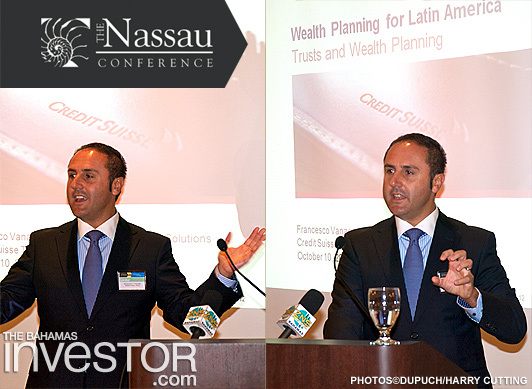 The Nassau Conference is an annual event bringing together the industry’s leaders. This year’s theme was “Preparing Ourselves in a Global Context with a Regional Focus” and speakers also included Bahamas Financial Services Board chief executive officer Aliya Allen.